Authors: Kate S. Carroll, et al. Proteins, the molecular machines that mediate the processes needed for cells to live, perform marvelous types of transformations thanks in part to the chemical diversity of their amino acid building blocks. Amino acids do not only participate in exciting reactions, but they are also as targets themselves of regulatory chemical modification events known as post-translational modifications (PTMs). These relatively small chemical changes in amino acids affect protein localization, stability, and activity, and therefore are crucial in regulating the state of our proteins inside the cell. Cysteines are amino acids prone to be post-translationally modified due to the various redox states the sulfur atom take (Figure 1, oxidation states in red). Of these, cysteine sulfinic acid (also called cysteine sulfinylation) has garnered recent interest in the PTM community. Although it had been previously observed, it was thought to be either irreversible or a mere accidental artifact that arose during experimental manipulation of the proteome, thus putting doubt on its role as a regulatory PTM. Recently, however, researchers observed the first instance of reversible cysteine sulfinylation catalyzed by the enzyme sulfiredoxin (SRX). This discovery, along with further findings that SRX might have a role in disease, rekindled the notion that cysteine sulfinic acid has an important regulatory potential. However, detection of this PTM remains quite elusive. Figure 1: The various oxidation states of cysteines in proteins. [O] = oxidation events. On this paper, the groups of Kate Carroll at The Scripps Research Institute and of Jing Yang at the Beijing Institute of Lifeomics team up to develop a method to detect sulfinylated proteins that might be targets of SRX. They design a diazene probe (DiaAlk) that contains two main virtues: (1) an electrophilic nitrogen group that forms a stable adduct with the poorly nucleophilic cysteine sulfenic acid PTM and (2) an appended alkyne tag that facilitates further bioorthogonal “click chemistry” to enrich or “pull-down” the tagged proteins (Figure 2). 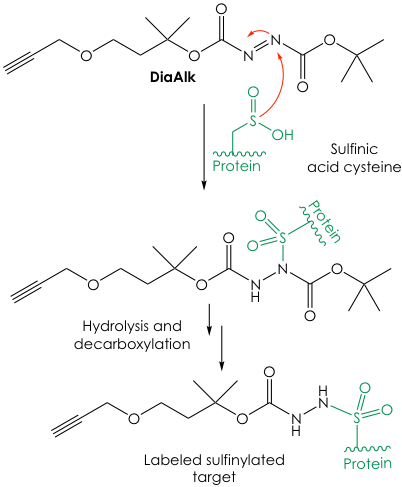 Figure 2: Labeling of cysteine sulfinic acid using the DiaAlk probe. To validate their idea the groups synthesized DiaAlk and successfully reacted it in vitro against proteins that contained the sulfinic acid PTM. They also synthesized a fluorescent version of the probe, called DiaFluo, that was able to react with sulfinic acid-oxidized cysteines in vivo. However, the main focus of the research was to use DiaAlk in native lysates from human cells. Sufinylated proteins get tagged with DiaAlk and are “pulled down” via an orthogonal reaction with azide-containing biotin. The enriched targets are then digested to smaller peptides and analyzed by mass spectrometry to reveal their identity within the human proteome (Figure 3). Under this approach, the researchers were able to find hundreds of sulfinylated proteins across two major human cell lines. Moreover, they validated 55 of these as new targets of the SRX reductase. Figure 3: Chemical proteomics platform to detect and identify sulfinylated proteins in mammalian cells. While, in principle, this sounds very simple, the experiments were in reality quite involved, but elegantly designed to only capture cysteine sulfynilations and exclude cross-reactivity of the DiaAlk probe with other amino acids or PTMs (such as other nucleophilic residues, regular cysteines, or sulfenic acid-containing cysteines). If curious, the reader is encouraged to visit the original paper to get details on this innovative approach. The method, of course, is not free of limitations. The major hurdle to address is the labeling of sulfinylated cysteines directly in live cells, which is currently restricted to lysate-only tagging with the DiaAlk probe. Regardless, the present platform is profoundly empowering and allows for the mapping of this elusive PTM across previously uncharacterized biomolecular targets. Overall, these efforts will enrich our biological understanding of the very much unexplored realm of regulatory cysteine PTMs.